(Newser) – Afghanistan is promising to step up its scrutiny of its own security forces following a surge in "green on blue" attacks. Insider attacks have killed nine US service members in the last 12 days and Afghan officials say nearly 200 new intelligence officers have been assigned to go undercover to prevent attacks, joining hundreds of others assigned earlier this year, reports the Washington Post. 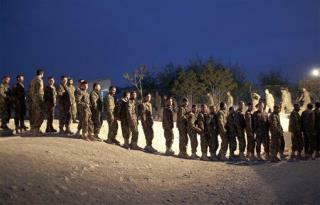 New recruits have been banned from using cell phones, in case they try to contact insurgents. Hey guys,I could simply add that this is a sign that the afghan people had enough of the Nato troops on it's soil,they are a people,and we are in there land,it's unacceptable. But,no matter what,we must battle al qaeda,and all REAL terrorists,not any muslims we see,LOL! We also instead of spending millions of bucks on weapon development,we are so outweighing foreign powers that we should give some of dat to the millions in afghanistan and Iraq that we left homeless and hungry and half dead!. Let's see: We could kick the foreign invader causing all the trouble out of our country; OR We could spy on each other. Hmm . . .
afghanistan is promising? ha hax9999999999999999999999999999999999999999. we should make a promise of our own to them in return. we promise to get the hell out of there and than turn you into a parking lot!